On my September scouting trip for my just completed Maui workshop I hiked cross-country down the rugged flank of West Maui, searching for lava-rock tide pools I’d read about. Scrambling down a steep hill and over sharp rocks, I found the beach but decided it was too dangerous for a group. Rather than return the way I came, I continued picking my way along the shore and eventually found another spot I liked better. At first I thought this wouldn’t be suitable for a group either, but climbing out I found an overgrown dirt road/trail leading back to the highway (“highway” in this case is the one-and-a-half lane, mostly-paved, rental-agreement-voiding Highway 340 circling West Maui). Fearing I’d miss this obscure spur from the main road, I saved its position on my GPS. Last Sunday, the day before the workshop started, I picked up Don Smith (Don assisted this workshop; I’ll return the favor for Don’s Northern Arizona workshop next week) at the airport and was excited to share with him the spot I’d “discovered” (it’s not as if I’m the Edmund Hillary of landscape photography—there’s enough debris down there to indicate the spot is known to locals) and off we went. The steady rain that had been falling for most of the afternoon increased with the road’s remoteness and soon we were slaloming around boulders dislodged from the surrounding cliffs by the downpour—at one point we passed a car waylaid by a grapefruit-size rock embedded in its windshield. Closely monitoring my GPS, at the prescribed location and without hesitation (for dramatic effect) I veered left into a gap in the trees almost as if I had a brain. The narrow track unfolded between rapidly oscillating wipers, immediately plummeting the steep hill and twisting right. Dense foliage brushed both sides of the car, which by now was clearly losing purchase in the mud. Don hadn’t quite finished a sentence that started, “Are you sure…,” when it started to dawn on me that I’d never intended to actually drive this road, that my plan when I marked it six months earlier was to park at the top and walk down. Oops. Propelled by momentum, and without the benefit of traction, completely at gravity’s mercy, we careened down the hill (remember the jungle slide scene from “Romancing the Stone”?). Steering seemed to have more influence on the direction the car faced than it did on its direction of travel and I quickly gave that up. If it weren’t for the deep ruts that occasionally nudged us back on course, I’m sure we’d have bounced into the jungle. I held my breath as we approached a protruding boulder and exhaled when the undercarriage passed above unscathed. Shortly thereafter the slope moderated somewhat and I nursed the car to a stop, miraculously still on the “road” (more or less). After a few seconds of cathartic expletives, Don and I scanned our surroundings. Backing up the slippery road was out of the question, but a little farther down the slope we spotted a flat clear space with a small Y-spur that might enable us to turn around. I scrutinized the dash for the switch that would engage the 4-wheel drive (I swear) the guy at rental agency promised my SUV had. When we didn’t find it Don dug the manual from the glovebox—apparently 4WD is an option the powers-that-be at Alamo deem unnecessary on Maui. Uh-oh. With crossed fingers I gave the car some gas and felt the wheels spin with no effect. More expletives. Don and I exited into the rain to survey our predicament—the road was fast progressing to creek status, and where rubber tires were supposed to be were instead four mud disks. Hmmm—that would explain the whole no traction thing. Scraping the tires clean would have been of little value because the next revolution would simply reapply a new layer. Back in the car I found that cranking the wheels 90 degrees gained just enough traction to free us and I gingerly rolled the car downhill and onto the open space. Yay! Once on level ground, and with only a little bit of slip/slide drama, I pivoted the car into the Y and turned around to face the direction we’d just come. Now for the hard part. Looking for the first time toward freedom, we came to grips with the chute that had deposited us: Not only was it steep, at the steepest point it curved hard-left, but banked hard-right—not exactly a design that would be embraced at Daytona. I inhaled and goosed the gas—we shot upward, fishtailing like a hooked marlin before losing momentum and coming to a stop a mere fifty feet closer to freedom. This time the car was skewed 45-degrees to the road, its left-front fender in the shrubs on one side, its right-rear fender in the shrubs on the other. When I gave the car gas the tires spun hopelessly. Facing defeat we started strategizing Plan B—with an hour of daylight remaining and no cell service, we’d need to walk up to the highway and hope to flag down in the rain a good samaritan willing to drive two disheveled, mud-caked strangers back to civilization (about 45 minutes away), then hope to summon a tow truck that would extricate us. While Don trudged up to the main road, I stayed with the car, licking my wounds and feeling pretty foolish. Sitting there it occurred to me that since the road was too narrow for a tow truck, and the distance and tight curve would make winching difficult, even a tow truck wouldn’t guarantee freedom. Watching Don head back up the hill to seek help, I decided to give extraction one more shot. I put the car in reverse gave it more gas and cranked the steering wheel back and forth violently until the tires broke free. So far so good. I took my foot from the brake and let gravity and the rutted road return me to the clearing. Once there, I gave the pedal a gentle nudge in reverse and made it all the way to the back side (another 20 feet) where there might be a little more gravel and less mud, and most importantly, a little more room to gather momentum. With a small prayer I slipped the transmission into in first and floored the accelerator, rocketing forward with enough forward speed to avoid much of the fishtailing I’d experienced earlier. Past the crumpled shrubs and protruding rock I shot. As the road steepened my momentum slowed and I could feel the wheels spinning but I just kept my foot to the floor. Approaching the curve I felt the car start to tilt right and slow almost to zero but somehow the tires maintained just enough grip to avoid a complete stop. I rounded the curve and surprised Don, who retreated up the road and turned to cheer me forward. By now the fishtailing exceeded the forward motion but I didn’t care as long as there was still forward motion. A short distance beyond the curve the road leveled and much of the mud turned to rock—I was free! Not wanting to stop until my tires kissed pavement I lowered my window and high-fived Don as I shot past and onto the highway. At the top we just couldn’t stop laughing, both at the foolish predicament I’d created, and our utter disbelief that we’d made it out. But anyway…. The group quickly scattered and I found myself over on the far side of the point with several others. Dark clouds scooted overhead, intermittently dumping rain that sent us scurrying to nearby sheltering rocks before stopping as quickly as it started. Between showers I worked on compositions that featured reflective pools sheltered from the crashing surf by volcanic rocks, hoping for a colorful sunset that would reflect in the smooth water. Given the predominant cloud cover I wasn’t particularly optimistic, but spent my wait-time working out compositions just in case. This was my first shoot with my backup camera, the amazingly compact Canon EOS SL1 (pressed into service after my 5DIII did a Greg Louganis into a creek in the Iao Valley that morning). Not only was I able to take advantage of the relatively static conditions to craft compositions for later, I was able to use the time to familiarize myself with this camera that I’d only used once before. So I was ready when, much to my surprise and pleasure, the sun broke through just in time to paint the horizon pink, I was ready. I clicked a number of frames of the various compositions I’d found earlier, timing each with the crashing surf and varying my shutter speed for different wave effects. 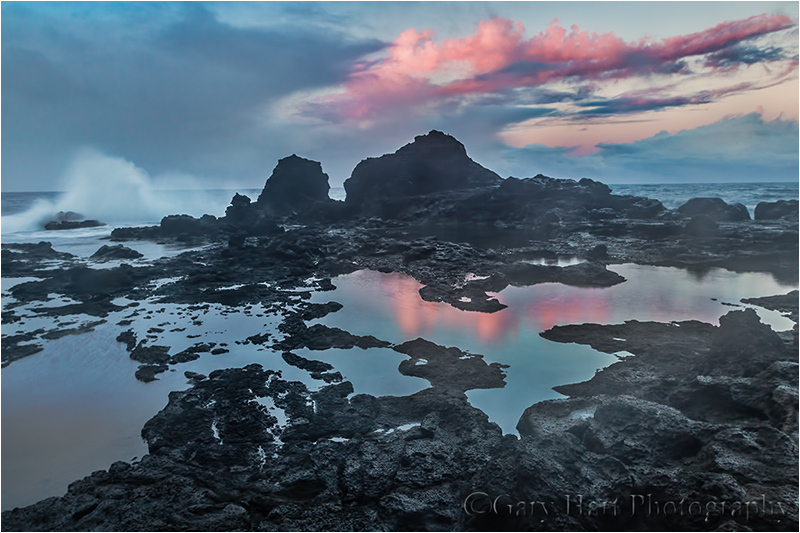 Join me in my next Maui photo workshop—we’ll visit this spot, Haleakala, Hana, and a lot more. Sounds like fun!! Been to a few crazy scenarios like that dealing with Jeep roads in Colorado. Glad you made it out of there safe. Love the photo as well. Sometimes the journey is better than the destination. Looking at this beautiful, serene, photo, no one would ever imagine the scene getting there and out! Happy you are safe. Sometimes it’s not the wonderful sunset, but the story that accompanies, that makes a photo special. Long live Squirrel Rock! I about wet myself reading this! Glad it all worked out! Enchanting, Gary. If we could all but see the world as Gary does, our life’s would sparkle. Oh, Gary, as far as the narrative goes, you didn’t miss your calling as a writer, but it could be an avocation.LOL You had me in stitches, especially the part about reminiscent of “Romancing the Stone”. Thanks, James. Yeah, anyone who has seen that movie knows exactly what I’m talking about. Glad you are safe and thanks for laugh! Don may never let you drive again! 😄 When it’s my workshop, he doesn’t have a choice.